This article honors the historic racing spirit of Ulster County. This September, two unusual races take place here. The Catskill Conquest Pilot Rally partially follows the historic auto-endurance race of 1903 sponsored by the National Association of Automobile Manufacturers (original 800 miles from NJ to PA). The September 22nd race starts in Ulster County and runs 75 miles to Unadilla, NY. On the 29th of September, The Fourth Annual Cats Tail foot race, another endurance contest, covers approximately 26 brutal miles of mountain and rubble-strewn trails starting on Fox Hollow Road, off Route 28 in Shandaken, and running up and down mountains: Panther, Giant Ledge, Slide, Cornell, Wittenberg, and finally to Phoenicia. It passes only one inhabited building on Winnisook Lake, Ulster County Route 47. See Calendar of Events for details on the Sept 22nd Pilot Rally. It’s our wont to move. Fast. On water, land, in the air. We want to move and we want to test the limits of that motion. This is a FAST trip through a few of the contests that have taken place in our area. Saugerties Driving Park (Green at top) from 1891 Beers Atlas from the collection of Chester Hartwell. The first historian to respond was Audrey Klinkenberg of the Town of Saugerties. Audrey provided two newspaper articles from the Saugerties Post. 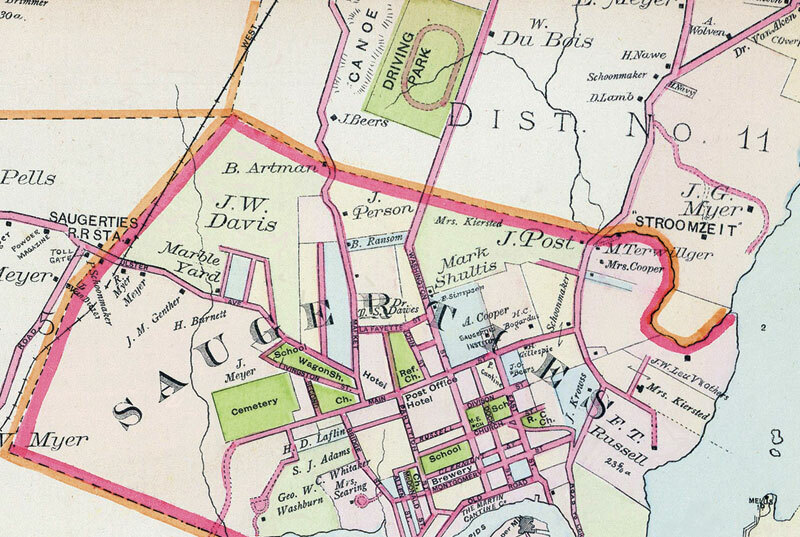 From Martin Bruegel’s history, Farm, Shop, Landing: The Rise of a Market Society in the Hudson Valley, 1780-1860 We learn that New Paltz was in the game, too. “Abram Deyo Brodhead opened a half-mile race track on the west side of the Wallkill at the intersection of Mountain Rest and Springtown roads in 1891. Horse races were run there on a regular basis during the summer. Crowds of up to 2,000 people gathered there on national holiday. Bicycle and foot races and baseball games were often scheduled as part of the day’s entertainment. The track closed in 1904 after this form of betting (was) declared illegal by the State of New York. Local horse racing died a slow death locally, but wheeled-racing took on the challenge. On July 16, 1897, the Post provides this story, “Saugerties. 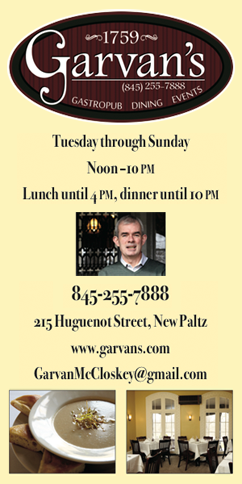 THE BICYCLE RACES – Second Annual Meet of the Saugerties Bicycle Club. 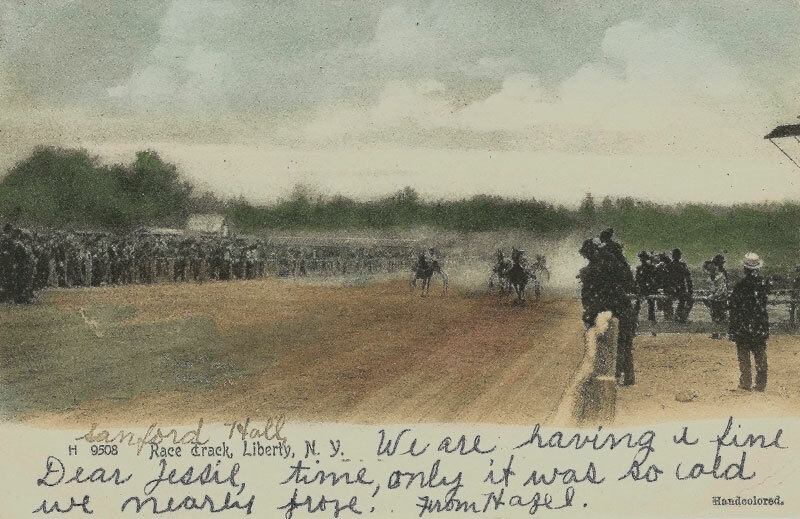 – A Fine Day and Good Racing – Large Crowd – The Ulster County Championship Won by a Dark Horse – Big Day for the Town.” Two thousand spectators watched the races on a beautiful day after several days of torrential rains. The track was said to be in fine shape the day of the race. One of many popular auto racing venues was the Rhinebeck Speedway. Tony Musso writes in his article for the May 16, 2016, Poughkeepsie Journal, “Midget car racing was a hot sport at fairgrounds.” Musso tells us the original site was developed for horse racing, but in the Summer of 1922 autos were the draw. It was not until 1934 that regular auto racing was featured there. Over time, the caliber and kinds of cars changed in the Hudson Valley as in the nation. Street-standard cars raced early in the century, and many races had more to do with endurance–the auto and driver needed to prove themselves to the driving public. Racing street cars morphed into vehicles built by teams supported by advertising for the purpose of racing–now primarily for speed. 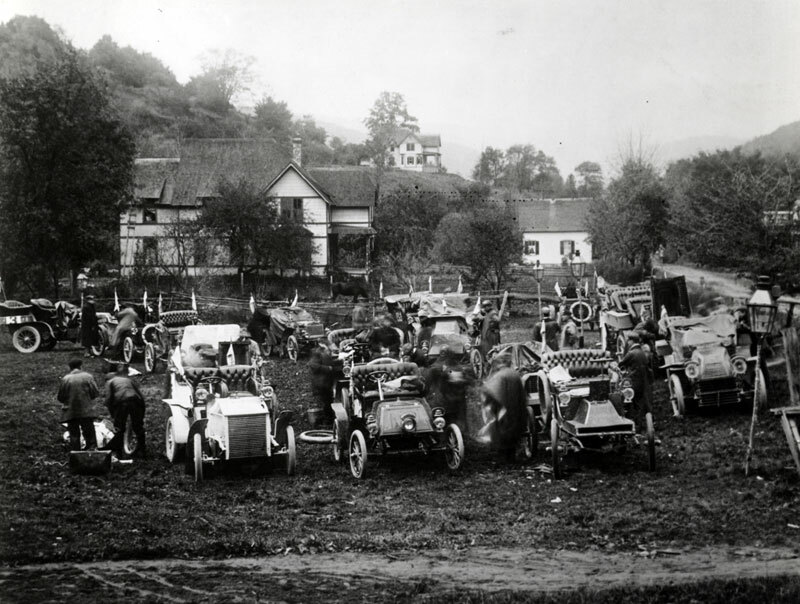 Cars parked overnight at Pine Hill on October 7, 1903 for the 800 mile endurance race, collection Detroit Library. In the late 1920s through the early 1940s, midget cars were very popular. By the late 1940s, stock car racing overtook midgets in fan-popularity. This created an opening for novice drivers as it was easy and inexpensive to participate. It also encouraged new fans as more children grew up with a “racer” in the family. Technological changes made for rapid advancement in the safety of drivers and fans and changed the sport of auto racing to include a wider variety of vehicles. That is evident today in racecourse offerings. But in all, speed, driver skill and endurance, and car design get the checkered flag. A local track still accommodating racers and fans is Accord Speedway (299 Whitfield Rd, Accord, NY). According to its website, the variety of contests now includes Modified, Sportsman, Rookie Sportsman, Pure Stock, 4 Cylinder, Junior 4 Cylinder, and Wingless Sprints. This year, Accord runs until October 24th. Historically, the most widely known races in the Hudson Valley were the Intercollegiate Crew contests that brought teams to Highland and Poughkeepsie from all over the U.S., including the legendary Washington team, subject of the best selling book, Boys In The Boat. It is the mesmerizing story of the young men from the U.S. and their 1936 Olympics race in Hitler’s Germany. Marist College Library archives website contains the following intercollegiate crew race information. The Poughkeepsie Regatta quickly became one of the greatest sporting events to watch in the country and put Poughkeepsie on the map. Every year tens of thousands of spectators would come pouring into Poughkeepsie to watch the races. The spectators covered the shores next to the river, many waiting all day, picnicking on blankets, to ensure they had a good view. The railroad tracks on the west side of the river had a flatbed train that held grandstands from which spectators could watch the race. 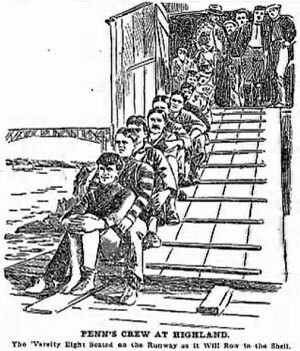 As the crews rowed up the river, the train would keep pace with them, giving the people on board the best view possible. 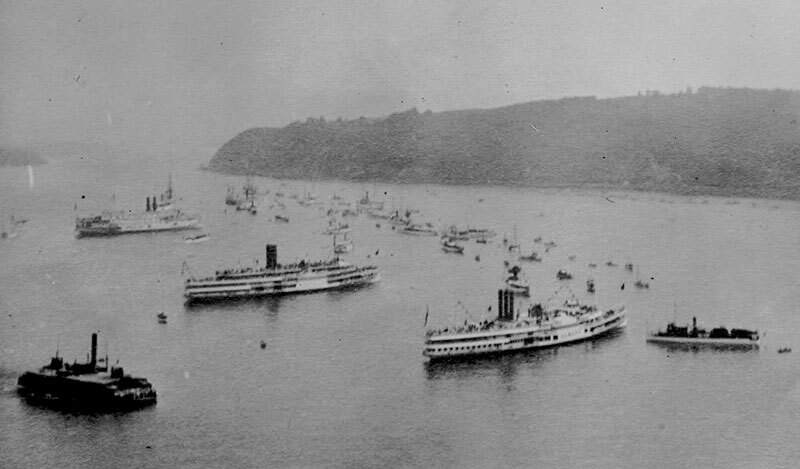 Hundreds of boats, yachts, and occasionally even Navy destroyers sailed to Poughkeepsie and moored on the sides of the river to watch the event. The races were held from 1895 to 1949, except during WWII. Most of the early crew teams stayed on the west shore of the Hudson River at Highland hotels and boarding houses such as Bellevue Villa and The Hill Aire, among many others. The 1914 Wisconsin team stayed at the artist colony, Elverhoj, in Milton, NY. Their accommodations were built by Highland’s Raymond Riordon School boys and consisted of platforms with tents. The Riordon boys also provided the team’s meals. On Wisconsin’s website, in its yearbook for 1916 are photos of the tent-accommodations at Elverhoj and team members. Crew teams continue to row along the same stretch of river starting early Spring and then to race as the weather warms and the competitors show up on weekends. Marist College boathouse was the former Cornell team’s home and has been completely restored. Many other groups and styles of boats now race in the calm river of early morning. If you can time it, you can have a race… At the aforementioned Riordon School, the boys worked at keeping the school humming–doing everything from running the electrical generator to procuring food from local farms, from felling trees to building construction and chinking walls. Not to put all that effort to waste, they also won contests in timed tree felling. “A December 20, 1970, Poughkeepsie Journal blurb from its “50 Years Ago Today” column writes of one event: “Boys of the Raymond Riordon School at Highland, N.Y., established a new junior record for felling oak trees in a competition at the school recently. John Kurts of Clearfield and George Spring of Bristol felled a 14-inch oak in 47 seconds and in the company with two other boys stamped and cut the tree into lengths in another four minutes.” Coverage of this event was to be found in many newspapers as the Riordon School’s students came from all over the U.S.
Not all Hudson River crafts racing had winners. One of the most famous and saddest was the steamship race ending in the 1845 sinking of the SS Swallow in her bid to beat the SS Express to Albany. The Swallow crashed into the rocks near Athens, quickly catching fire and sinking. At least 15 people did not make it to shore. Lessons were easily forgotten, and a second deadly steamship race in 1852 between the SS Armenia and the SS Henry Clay also ended in tragedy. It is said the Clay in an attempt to cut off the Armenia hit it, taking off the front of the Armenia. The Henry Clay’s boiler exploded after she continued full-speed into the shore near Riverdale, NY. The wreck took the lives of about 80 passengers, including that of Newburgh’s Andrew Jackson Downing, a famous landscape architect. This wreck was the impetus to outlaw steamship racing on the Hudson. An “inter-species” race took place occasionally from Highland to New Paltz when Levi Calhoun challenged the New Paltz-Highland Traction Company trolley. Levi’s advantage was the trolley’s duty to pick up or discharge passengers all along the line of some eight-plus miles. Having known Levi, I would not be surprised if he chose to race during the rush hour, but I have no proof that was the case. According to the late Peter Harp’s book, Horse and Buggy Days, the race often finished in a tie. See Levi Calhoun story. PS. If you don’t know what this is about, ask someone over 50 who grew up in rural NY. Hidden treasure: There is a monument honoring our men who died in submarines. The monument is located at VFW Post # 8645 in New Paltz on Route 208. Unless otherwise noted all images are from the Collection of Vivian Yess Wadlin.